Gwinnett drove a ton of shots to the net in a 5-4 regulation win at Kalamazoo last week, sending the home team to first regulation loss in its last six games. The Gladiators had 17 first-period shots, but no goals. That all changed in the second, as four pucks found the net. Forward Everson Marshall had a productive game, scoring two goals and tallying an assist. Evan Bloodoff, Antoine Corbin and Josh Currie added the other goals. Gwinnett finished with 41 shots on goal. Goalie Brad Phillips made 25 saves to earn the win. After emerging from the doldrums of a losing streak with six wins in eight games, the Gladiators fell back down to earth last week. Gwinnett lost four of five games and a postseason berth looks far away at this point. With the third fewest points in the ECHL’s Eastern Conference, it would take a miracle for the Glads to get back into playoff contention. Still, a lot of games against division opponents remain and whether or not Gwinnett is in playoff contention should make no difference when going against rivals like Greenville and South Carolina. From this Thursday through Feb. 6, the Glads have four straight games against South Division foe Orlando. Gwinnett has made so many trades this year it is hard to keep up with, but another deal got done earlier this week. 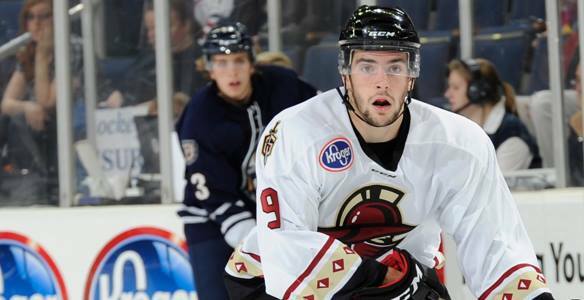 The Gladiators traded defenseman Sacha Guimond to Ontario for defenseman Matt Clune. Guimond played 22 games in a Glads uniform and scored one goal in addition to recording five assists. It was a disappointing season for Guimond, who came to Gwinnett from San Francisco after being named ECHL Defenseman of the Year last season. Clune is a native of Toronto and brings a tough game to his new squad. In 31 games with Ontario this year, he racked up 66 penalty minutes while managing to produce a plus-four rating. As a defenseman, to be on the plus mark is a good sign that Clune is strong in puck control and clearing the zone. To go along with that, Clune scored a goal and added four assists this year for Ontario. Overall, the trade looks relatively even. It seems that Gwinnett wanted more out of Gui- mond, but he never got on track this season. Clune should give the team more toughness and grit.